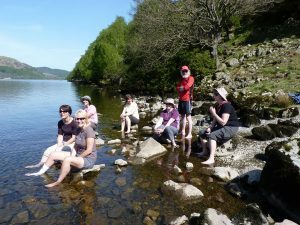 We are a friendly, informal group of like-minded people who meet frequently to enjoy outdoor activities and social events. Our programme is full and varied; there is usually at least one event every week. We hold day or evening walks and cycle rides in the local area. We also arrange longer trips away in the UK, often on Bank Holiday weekends. These may be to hilly and mountainous countryside, to slightly less demanding terrain or to coastal areas. The accommodation is usually in Youth Hostels, although we also camp, stay in bunkhouses and take over large, self-catering houses or shooting lodges in out-of-the-way locations. We’re keen to try our hand at other outdoor – and, indeed, indoor -activities too. Successful events on the programme have included coasteering, wild swimming, Go Ape, trampolining and energetic, if not very polished, ceilidhs. In addition, we offer a regular monthly social meeting and other social activities, such as badminton, tenpin bowling, cultural or music events, cinema or theatre trips, BBQs, meals out, etc. 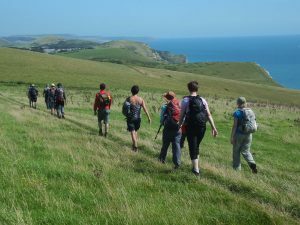 We try to offer walks and cycle rides at a range of levels, so there is something suitable for everyone. Most of our events require no more than an average level of physical fitness. But if you are after something a little more strenuous, then you will meet members with similar interests to keep you company. In either case, the emphasis is on having fun and meeting people. All the events are arranged by our members, who are encouraged to suggest new and interesting ideas for the benefit of all. We’re happy to support any of our members if they wish to organise and run an event (but it’s not a membership requirement). The Ipswich Outdoor Group started in 1976 (under a different name) and currently has around 200 members (singles, couples and families) across a broad age range. Although many of our members live in and around Ipswich, we are open to people from all over Suffolk and the surrounding areas. We have a few members further afield in the UK too. Ipswich Outdoor Group is affiliated (as a Local Group) to the YHA (England & Wales), a registered charity.